The North Face ® Tech 1/4-Zip Fleece with your company logo is the perfect layer for spring skiing and early season hikes, this versatile, smooth-faced fleece features a quarter-length zipper that lets you easily regulate temperature. Made of 235 g/m2 100% polyester fleece with soft-brushed interior, our The North Face features a hardwearing design with pill-resistance and a cadet collar Its reverse-coil quarter zipper for easy venting is functional when on the move and dries quickly to minimize heat loss. The contrast embroidered The North Face logo is displayed on the left sleeve and The North Face 1/4 Zip Fleece is a great gift for all who love adventure! A true name brand fleece pullover that will be appreciated. Typical Imprint Area(s): Left or right chest approx. 3.5". 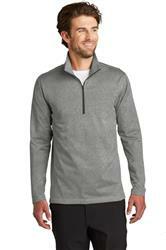 Available Imprint Options: The North Face Logo is embroiderd on Left Sleeve. Additional embroidery locations add approx. $3.00 depending on stitch count. Also inquire about a ladies companion style! The North Face® products cannot be sold blank and may be decorated or embroidered on a pre-approved basis.